Image: Steven Camley Cartoon, The Herald. The paper then goes on to highlight some further detail on the eleven measures that are proposed to be included in the Land Reform Bill. Some of these were highlighted in the First Minister’s legislative programme last week – see previous blog but some are new. Here follows all eleven proposals. 2. Limiting the Legal Entities that can own land in Scotland This is a new proposal and very welcome. Again it follows a recommendation of the Land Reform Review Group and previous debates around the Land Registration Act (see my evidence here) It also addresses the concerns of law enforcement and taxation authorities about money-laundering (1) There has been a long-standing problem of land owned by companies registered in offshore tax-havens. Some own large tracts of rural land and some own urban property – including quite a bit of Charlotte Square in Edinburgh near the First Minister’s official residence. It is quite ludicrous to permit this state of affairs to continue any longer. This was highlighted last week. What the Government propose is a new duty on the trustees of charitable bodies to “engage with the local community and consider the potential impact on the local community before taking any decision” Such a power would be useful but it does not go far enough. Where charitable status is granted to private landowners who then restrict membership of the organisation to a tight group of family and friends, what is needed is not better engagement but better democracy. Announced last week, the Paper makes clear that the proposal relates to the so-called sporting rates abolished in 1995. It would be helpful if the term “business rates” was done away with. It has no legal meaning and is misleading. Such rates are not a tax on businesses (mainly concerned with income tax and corporation tax), they are a levy on the rental value of non-domestic property. The Scottish Parliament is assessed for non-domestic rates (NDR) as are bus stops. Neither is a business. Much though needs to be given to how such rates are to be assessed. I will be arguing strongly that it be done on the rental value of land – an approach that the Mirrlees Review (Chapter 16) recommended should be applied to all NDR. I particularly welcome the plans to reform the law around common good land. This is land owned by towns and cities across Scotland that is for the benefit of the residents and os often of great antiquity forming part of the original Royal Charter of the burgh. The legal framework around is complicated and out of date and leads to conflict between councils and communities. Common Good is the oldest form of community landownership and the vast majority of Scotland’s population who live in towns and cities deserve a better system of managing it. All of these proposals will be subject to extensive debate over the coming months and already there are powerful vested interests engaged in trying to derail them. Scottish Land and Estates issued a press release through Media House in which it expressed “disappointment that the Scottish Government continues to miss an opportunity to create modern and meaningful land reform.” I think modern and meaningful land reform is what is in fact beginning to take shape. There is a long way to go of course. But Scotland is changed now. Thousands of people were energised by the referendum campaign and now want to use the existing powers of the Scottish Parliament to secure a fairer and more prosperous country. Great to have the rubber stamp from The Godfather of Land Reform. Thanks for all your diligence and insight over the years Andy. I am not the Godfather but thanks! Mebbe no the Godfather but a bonnie fechter in a grand cause – keep it up!!! As fit a fechter as ever fought in this grand cause. Keep fighting the good fight Andy. The tide is finally turning and you’re backed by the many. I have been following this carefully. I don’t quite see a clear track away from council tax towards a comprehensive land value tax. This, to me, is important as land value inflation is the major cause of house price inflation. A land value tax would go a long way towards stabilising house price inflation, leaving homes more affordable to buy and land more affordable to acquire for new social housing in the future. I would like to see a comprehensive discussion of the proposals on facebook or Bella Caledonia if possible. I agree. I will be publishing details on a route map from the existing fiscal regime to land value rating soon. It is also the fundamental reform to increase equality & prosperity in Scotland within existing powers. It will require cross-party consensus though if it is to endure. Three days that changed scotland. It cant come fast enough. Could rent controls and security for private house tenants come under land reform? For anyone who hasn’t already read it and is interested, a 25-page UK Parliament report ‘Land Value Taxation’ by Antony Seely was published on-line on 17 November this year. Andy, thanks for your hard work. regarding 9. & 10. above. really hope the long term tenants get the right to buy, it is just so old fashioned and restrictive to have to go crawling to the factor if you want to implement a slight change or a good idea. As for the wild deer being a public resource, this will just have the land owners spitting mad. They have spent a fortune on deer fencing where i am, all to keep the deer IN, and far away from the locals. They also feed the deer concentrates. And have evicted most of the sheep men on the hills, so it is just crazy to think that long term deer populations are a problem. The private estates have total engineered the current population problem through fencing, feeding and sheep removal. Andy, I have followed your informed comment on this topic in all the threads of social media with interest. Imagine my surprise upon visiting my father in hospital to find his reading material was your book! Well that is interesting but not sure its the best reading for someone who is not well! The Scottish Government proposals are most welcome – it seems to me that they have been drafted with the interests of the Scottish people foremost, rather than the interests of the powerful. Does anyone know if it was pure coincidence that the BBC’s Landward programme last Friday evening gave Scottish Land and Estates unfettered and unchallenged airtime to tell the people of Scotland what a wonderful and important thing large sporting estates are? My favourite bit from the programme was the person who spoke with glee about the fact the that, “the birds were very sporting”, by flying at the right angle towards the guns. I’m sure the birds would be pleased to hear that … if they weren’t dead. hear, hear Donald. the birds were very sporting as they fled the beaters and flew to the killers. im not going to call it the ‘guns’ anymore. Imagine if i put an advert in the field magazine ‘ driven lambs’ reared on the green slopes and driven down to be shot for fun? 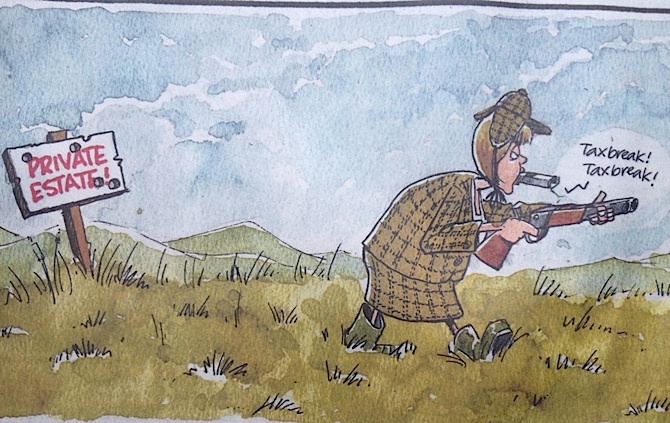 Come on Scottish Gov lets hammer down on this cruel childish pastime and give the red grouse special protection. As all householders are required to pay council tax, why not land estates? What is required is an annual land tax based on the land value – the value to be set by independent and seen to be independent land valuers. It should go without saying that land is Scotland’s most valuable commodity. A tad ot here, but hope readers of this blog can assist ; at the time of the Independence referendum, Rupert Murdoch and other establishment figures said something along the lines that they were worried about a population that had become more “awakened” as a result of the debates et al – I’d be grateful if anyone could provide links to article(s) on this please. locally i heard game keepers and farmers with multiple holdings warning against a YES vote. Saying that the scot gov would then threaten the rural way of life and go crazy with land reform. Now that we have land reform top of the agenda it would be interesting to hear the thoughts of these NO voters. SLAE are warning of a serious blow to land based businesses and Tories branding succession laws as horrifying. Leading to the break up of estates and farms. Well lets hope it leads to the break up of those NFU land banking, agribiz farmers with three or four farms. And will it be so bad for the big estates to have two children owning half the estate each? surely they could work together, ‘pooling and sharing resources’? Would the same number of keepers not still be employed even if more people owned the land ? . I think that gamekeepers are flinging in a red herring here . Maybe they have. other reasons ?. i recon if the large estates were split up and we had many more land owners then there would be a greater demand for the modern gamekeeper…. the warden. Explain the red herring please. Game keepers i know are onto a good number. Free house, vehicle, fuel, logs, meat, low wage but massive tips. And dare i say it, a certain level of power, like a rural land police watching over the estate, some keepers love this, many of the rest feel comfortable having a defined position in the estate order. The problem Scotland has with rural population and employment has nothing to do with the future of gamekeepers, they are relatively few and far between. Yes we will always be able to attract ‘in’ people who want the outdoor life styled around shooting. But the industry does not lay down generational roots ie, i want to be a keeper because this is what our family have done here for generations. Rural Scotland needs young people to be able to invest their future in rural Scotland, and explicitly in the ownership of businesses, property and homes. Don’t get me wrong, we can have keepers, they have a role to play, the problem i have is when SLAE do all the talking for them and make us believe that there is nothing else that can be done other than gamekeeping. The ” red herring ” , flung in by the keepers , is the apparent fear of the loss of employment . As you rightly point out , if they carry out their duties properly , then they have nothing to fear ?. …and of course there is the issue that much pheasant shooting etc is paid for by the taxpayer in Corporate Hospitality tax dodges. The in-thing to do, regarding anybody associated with land, seems to be the giving and receiving of awards! So i would like to take this opportunity to announce that i have set up a new award for sheep and cattle farmers. And i would also like to announce that the Scottish winner this year is my father. Sorry if this appears to be a bit pathetic and meaningless, but farmers have been getting a bad press lately. Finally i would like to thank SLAE for giving me the inspiration for creating this wonderful award. Nice one SS. It’s not pathetic at all. Did your father precede you in your farm? This may not be the right forum to do it in but it would be good to hear about why you nominated your father. As I always say, actual examples and true life stories are so much more opinion forming than the “blah and counter blah” that seem to characterise the land reform “debate”. Good Festive Season to you and your father if it’s not presumptious of me to say so. Neil.